Jorj Morgan is the author of five cookbooks, including At Home in the Kitchen, At Home Entertaining, and Fresh Traditions. Her in-the-trenches expertise in the culinary field includes owning her own catering company and cooking for family & friends. Visit her website, or find her on Twitter and Facebook. This is a guest post for October Unprocessed. If this is your first time here, welcome …and it’s not too late to join in! I started a professional catering business in the 1980s, when the word “foodie” was met with a vacant stare. Five cookbooks and many fabulous parties later, its hit me that foodies have always existed. Whether we chop veggies and drink sulfite-free wine in front of Dynasty or Modern Family, for the past 30 years foodies have shared the same value system. What are the tenements of said value system? I’ve laid them out for you in a bulleted list that links to my favorite recipes and pictures of the food I’ve loved and served, since shoulder pads were in vogue. …which pretty much means becoming a locavore! True story: a few weeks ago, as I finished the morning paper and prepared to head out on my weekly farmers market run, I saw an article from the U.S. Department of Agriculture stating that the number of farmers markets has skyrocketed since 1994. With almost 8,000 farmers markets dotting the country, it seems a travesty to waste natural resources loading food onto semis and barges. Get inspired by reading up on my Flavorful fava beans – quite the find at my farmers market this summer, and (now that mushrooms are in season) try out this Wild Mushroom, Roasted Red Pepper and Artisanal Goat Cheese Tart with Fresh Thyme. To do so is delicious, seasonal, enlightening, and lessens the degree of one’s carbon footprint. Try my Foolproof Rotisserie Chicken to see just what I’m talking about. A well-organized pantry is where this all begins, folks. Here’s a list of pantry staples from my alternate cooking blog, From Nana’s Kitchen with Love. Print it off and take it with you next time you shop. Spontaneous food can be delicious food – and getting everyone involved is part of the fun. Be bohemian! Put pillows on the floor, get a glass of wine in hand, and defrost a casserole you made with love the week before – here’s a comfort food favorite with an excellent wine pairing (Layer Cake Shiraz): Updated Tuna Casserole. You thought I was going to end that with “candle-stick maker” didn’t you? Well, I’m here to tell you that if you do strike up a conversation with the professionals in your grocery store’s meat and seafood departments, they can cut meat to your exact specifications and counsel you on the best, freshest, highest quality choice for the party you have planned. The meat isn’t free but the advice is – so give it a shot! I’m using this October Unprocessed challenge to motivate myself to finish out this year, and enter into the next with more energy, better health, and an enviable Body Mass Index. With any luck, my family will join in – and my readers will see that once they embrace their local farmers markets, stock their pantry with high quality, time-tested staples, and acquire certain kitchen gadgets, everything will come together at dinnertime. This dish is based on traditional Caprese salad that combines fresh mozzarella, ripe tomatoes and basil. The addition of grilled eggplant adds heartiness to this version. Gremolata is a garnish that combines lemon zest, garlic and parsley. To kick up our salad even higher, I added chopped egg to the gremolata. The result is a kissin’ cousin salad to the Caprese that’s just delicious served at room temperature where the flavors meld together. Brush the eggplant slices with olive oil and season with salt and pepper. Heat a grill pan over medium high heat. Grill the eggplant slices, in batches, turning once until golden and just soft, about 6 to 8 minutes. Cool to room temperature. 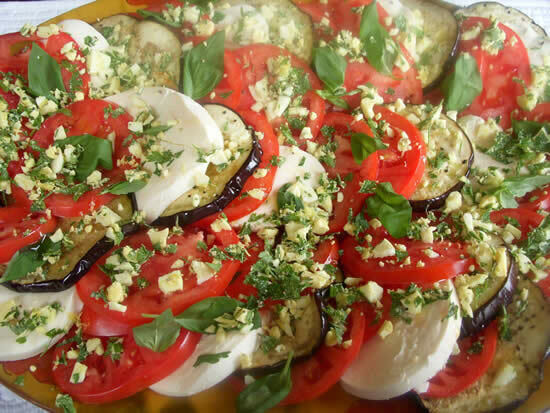 Assemble the salad on a large platter, alternating slices of tomato, eggplant and mozzarella. For the gremolata, place the chopped egg, garlic, lemon zest and parsley onto a board. Chop to combine the ingredients into a fine dice. Season with salt and pepper. Sprinkle the egg mixture onto the salad. Drizzle the dish with olive oil and a dash of balsamic vinegar. Grind fresh pepper over top. Serve at room temperature. Note: You can assemble the salad in advance, without the garnish. Cover with plastic wrap and place into the refrigerator. Remove about 1 hour before serving. Just before you present the platter, top with the egg garnish, olive oil and balsamic. Finish the dish with the chopped egg garnish, olive oil, balsamic and pepper. I really like the formatting of this EATING RULES blog. I haven’t seen the printable recipe concept embedded in a blog before, and will definitely add this site to my favorites, so I can print my shopping lists. Great font on the 5-item list too. What a great way to use that late summer produce. I love the additional of eggplant! I learned at a local Natural Science Museum lecture a few years ago that the term “food mile” was actually coined during World War I! Conserving transportation for the war effort was seen as patriotic, and was also the start of victory gardens. The local foods movement isn’t as new as some think. I am loving the 30 day challenge the posts and recipes. We have been eating unprocessed… well most of my life really. We never had processed food in our home growing up in San Diego. We grew much of what we ate and traded with neighbors. We had citrus and avocado trees in the back. We didnt need much more. I am greatful to my parents who set a good example for us. I have 4 teenage boys (who can eat a lot) and compared to many of their friends have very good eating habits, for which I am also greatful. Even my dog eats unprocessed. It is good to see other people realize how good real food can taste and how well bodies respond when not bogged down with chemicals and fillers that confuse our systems. Hurrah for food! Happy eating and thanks for all the great ideas. What a gorgeous salad! I love the addition of hard-boiled eggs to the gremolata for some protein. We still have beautiful tomatoes, so this one will be terrific to make before the season ends.